Alternating mattresses are a fantastic solution for patients at risk of pressure ulcers, but many beds will not provide adequate stability without the use of an underlay mattress. The Ultimate Healthcare Mattress Underlay provides a stable underlay for alternating mattresses, helping to ensure their efficacy. 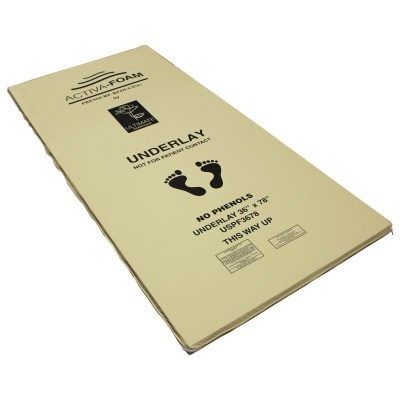 This underlay is designed for uneven surfaces, and is suitable for use on slatted, profiling and divan beds. The thin design helps you keep the lying surface within 220mm from the top rail, ensuring bed rail regulations are adhered to. Suitable for slatted, profiling and divan beds, the underlay works to provide a stable surface for alternating mattresses. This ensures that the mattress can work more effectively to reduce pressure, further helping to prevent pressure ulcers. The shallow depth of the mattress underlay (50mm) makes it easier for you to ensure that the lying surface stays within the 220mm regulation height from the top rail. This is vital for ensuring both patient safety and that your facility meets government standards. To help extend the longevity of the underlay, a waterproof and vapour-permeable cover is included. Easy to clean, this makes hygiene maintenance simple and efficient. Please note: The weight of this underlay is 2.8kg, and it is unsuitable for patient contact.